GreenDragon stream locates in the southern side of Yi Tung Shan(二東山). This stream possesses many attractive landscapes. Besides falls and cliffs, there is a big semi-antifical swimming pool in the upper stream. 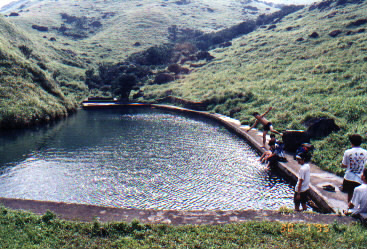 In rainy reasons, the pool will be flooded with water, hikers can access that pool by Lantau trial. Here is the entrance of the river which is on Lantau trail. This feature is called Lions Watching Falls (雙獅觀瀑). The two rocks indicated in red are the "Lions". After the "Lions", you will reach the middle exit where you can take a big rest before proceeding. This is the Green Dragon Fall (青龍瀑). The Green Dragon Fall should be the most challenging part in the whole stream. Lawman is now climbing a nearly vertical cliff in order to prevail the Green Dragon Fall. Breath-taking features come one after another. Right after the Green Dragon Fall, here comes the Green Dragon Wall (青龍壁). It is a high vertical wall standing straight. There are also some eccentric rocks around the heel of the Green Dragon Wall. Here the stream takes a 90 degree left turn, called Green Dragon Wags Tail (青龍擺尾). Here we reach the climax of the trip, especailly in hot summer time. The left picture shows two pools (天池), one big and one small. The big one is deep enough for diving, its size is comparable to a full-size standard swimming pool. A few years ago, you could still find a jumping board mounted on pool. However, in my last visit, that jumping board was broken. The smaller pool is built for kids. In rainy seasons, the pool is the oasis (right picture) on the Yi Tung Shan.